Spinach – a total knockout for getting your required amount of iron (folate), as are other dark, green, leafy veggies. 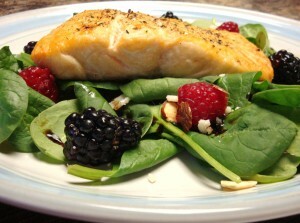 But today we will be featuring Spinach, along with Omega-3 Fat laden Salmon. Omega-3′s are good-for-you fats, just don’t ruin a healthy fish by battering it and deep-frying it. You have just defeated the purpose of having a healthy meat alternative option. Meanwhile, prepare salad by heaping spinach onto 2 plates, top with raspberries/blackberries, walnuts and dried cranberries. Place a salmon filet on top of each salad. Drizzle with dressing.